The BEST, Soft and Fluffy Idli recipe – It is the popular, traditional South Indian breakfast recipe that doesn’t require any introduction. 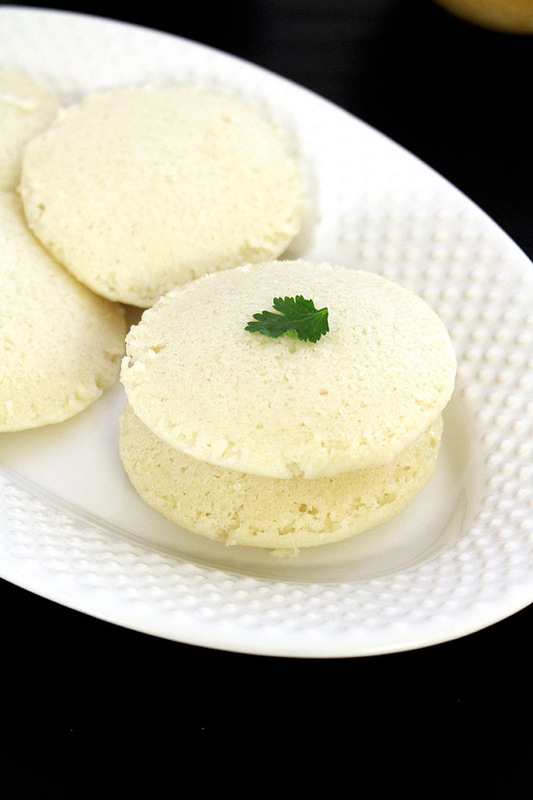 The idli recipe below has step by step pics with many tips and suggestion. Read them carefully and make these idlis at home and enjoy!! Every south Indian household has their own version of making idli-dosa. I have been using this recipe from past few years and my mom uses this since ages and I have no complains. 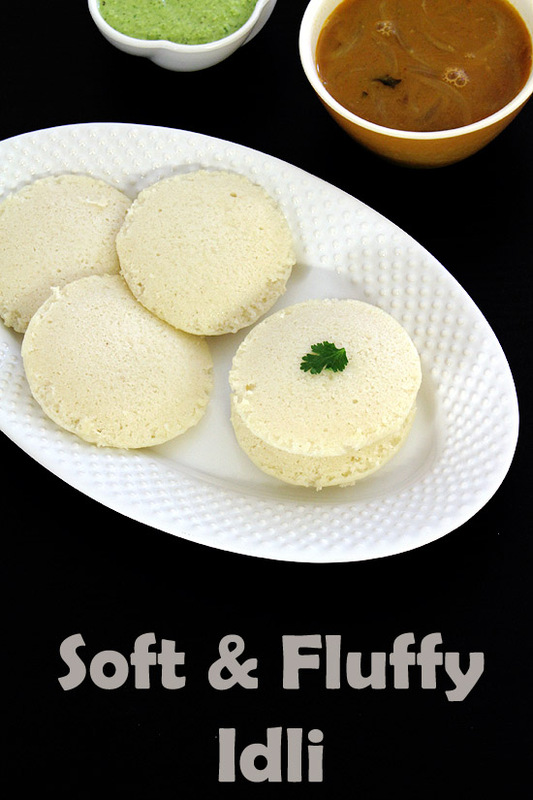 This recipe gives very soft, pillowy, spongy and fluffy idli. 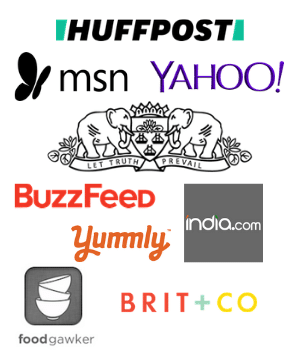 There are many variations in making idli recipe. Today’s recipe is made using parboiled rice aka idli rice and regular rice. It can be made using idli rava too. I will share that recipe in future. This given amount here makes a huge batch of idli batter which is too much for us (a family of two). So I usually make idli the same day. And store the leftover in the fridge. The next day I make dosa by using the same batter. Yes this batter makes the perfect, crispy dosa too. 1) Take urad dal and fenugreek seeds in a bowl. Rinse them with cold water or wash them under running cold water. But do not overwash them. We are not looking for clear water, cloudy water is fine. 2) Take both rice (parboiled rice and regular rice) in another bowl. Here I have used sona masoori rice. Rinse or wash them similarly. Again do not over wash them. 3) Soak them in water for at least 5-6 hours. I have used 1 ½ cup of water for soaking dal and methi seeds. And used 2 ½ cups of water for soaking rice. 4) After the soaking time, the size of dal and rice would increase. 5) Now let’s start with grinding process. I have done this in mixer grinder. You can do the same using wet grinder. Start with urad dal. Drain the water from the dal and reserve the water, we will use this water while grinding. 6) Take dal into the grinder jar. Start by adding ½ cup of reserved water. 7) Grind into the fine paste. As needed you can add little more water, but do not add too much. So total I used ¾ cup of water for grinding dal. The batter should be light, fluffy and smooth. 8) Remove urad dal batter into a large bowl. 9) Next drain the water from the rice and again reserve the water and use that for grinding. 10) Take rice into the grinder jar. If your jar is small then you can do this in batches. Start with ¾ to 1 cup of water and grind. 11) Grind them by adding little water as needed. I used total 1 ¾ cups of water. The batter will be little grainy and that is fine. If you get smooth batter and it is fine too. Sometimes grinder may get heated up, if so wait for some time, let it cool down and start grinding again. 12) Pour this rice batter into the same bowl with urad dal batter. 13) Mix it very well using spatula. 14) Cover the bowl with plate (do NOT use tight fitting lid) and let it ferment without disturbing for about 10-14 hours. If needed you can let it ferment for more hours, upto 24 hours. This time may vary depending of the weather and temperature. Check the tips section below to ferment in cold weather. 15) After the fermentation time, the batter will increase in volume by 2-3 times. You will also notice the sour fermented smell from the batter. 16) Take a look inside of the fermented batter. You can see so many bubbles in the light, fluffy batter. 17) Now add salt to the batter. Lightly, gently mix it. Do not stir vigorously. 18) Now prepare the steamer, add a glassful of water in the steamer and let it come to a simmer. Also grease the idli tray using oil. Pour the batter into prepared tray. 19) Steam for 12-13 minutes. You can check doneness by inserting a knife or toothpick in the idli. It should come out clean meaning they are ready. 20) Once done, remove them from the steamer. Let it cool for few minutes. Then remove the idlis using spoon of butter knife. Serve the idlis hot or warm. Leftover idli batter can be refrigerated for 2 days. With this batter you can make masala dosa, uttapam. Serving suggestion: serve idli with sambar and chutney. Always use fresh and good quality of urad dal. Do not over wash the dal and rice. Just rinse them 2-3 times only. Always use filtered water (Not tap water) for soaking and grinding. Never use tight fitting lid to cover the bowl of better while fermenting. Also use the stainless steel bowl or patila for fermenting the batter. Always add salt after the fermentation is done. If added earlier than the batter will not ferment well. If you want to add before fermentation then use the non-iodized salt. Add enough water while grinding. This plays a big role, trust me. The water may vary depending the freshness or quality of the dal. But above given measurements will guide you. If added enough and required water while grinding will make the right consistency of the batter. It should not be too thick or too thin and runny. The batter consistency should have medium thickness. If the batter has no right consistency, it will not ferment well. Idlis made with thin batter are flat and soggy. Idlis made with thick batter are very tough. If you are in India, and you are fermenting the batter in summer season. It should get ready in 8-10 hours or sometimes even less time. But if it is winter then it may take more than 10 hours. You can let it ferment up to 24 hours. You can keep the bowl near the heater. Pre-heat the oven to 180-190 degrees F or 90 degrees C, then turn off the oven. Keep the bowl inside of the oven and keep the oven lights ON. After 5-6 hours oven will get cold again. Remove the bowl from the oven and repeat same pre-heating process. Do this until batter is fermented. You can cover the bowl with warm blanket too. Since we have central AC in our home, my kitchen stays chilled during the summer too. So I usually keep the bowl into the cardboard box and keep this box outside in the balcony. I also make sure that it doesn’t get the direct sun light. I do this in summer only and the fermentation process takes about 10 hours only. During the winters, I have tried covering the bowl with heated blanket which maintains the temperature and will help in fermenting. I got good results. Troubleshoot: If the batter is not fermented well, then do not throw away. Add ½ to 1 teaspoon of baking soda in the batter, mix and prepare the idli. This is the traditional South indian idli recipe. 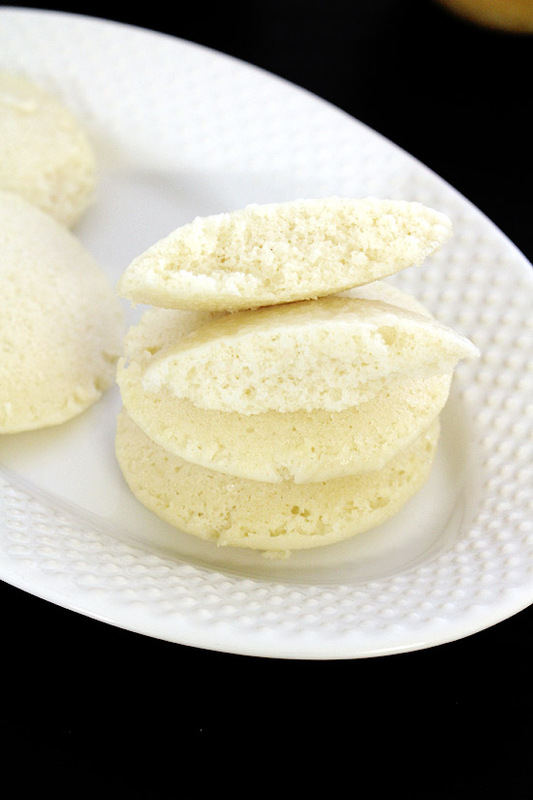 Using this homemade idli batter, you will get soft, fluffy idlis. Take urad dal and fenugreek seeds in a bowl. Rinse them with cold water or wash them under running cold water. But do not overwash them. Take both rice (parboiled rice and regular rice) in another bowl. Rinse or wash them similarly. Again do not over wash them. Soak them in water for at least 5-6 hours. I have used 1 ½ cup of water for soaking dal and methi seeds. And used 2 ½ cups of water for soaking rice. After the soaking time, the size of dal and rice would increase. Now let’s start with grinding process. I have done this in mixer grinder. You can do the same using wet grinder. Start with urad dal. Drain the water from the dal and reserve the water. Take dal into the grinder jar. Start by adding ½ cup of reserved water. Grind into the fine paste. As needed you can add little more water, but do not add too much. So total use ¾ cup of water for grinding dal. Remove urad dal batter into a large bowl. Next drain the water from the rice and again reserve the water and use that for grinding. Take rice into the grinder jar. If your jar is small then you can do this in batches. Start with ¾ to 1 cup of water and grind. Grind them by adding little water as needed. I used total 1 ¾ cups of water. The batter will be little grainy and that is fine. If you get smooth batter and it is fine too. Sometimes grinder may get heated up, if so wait for some time, let it cool down and start grinding again. Pour this rice batter into the same bowl with urad dal batter. Mix it very well using spatula. Cover the bowl with plate (do NOT use tight fitting lid) and let it ferment without disturbing for about 10-14 hours. If needed you can let it ferment for more hours, upto 24 hours. This time may vary depending of the weather and temperature. After the fermentation time, the batter will increase in volume by 2-3 times. Now add salt to the batter. Lightly, gently mix it. Do not stir vigorously. Now prepare the steamer, add a glassful of water in the steamer and let it come to a simmer. Also grease the idli try using oil. Pour the batter into prepared tray. Steam for 12-13 minutes. You can check doneness by inserting a knife or toothpick. It should come out clean means they are ready. Once done, remove them from the steamer. Let it cool for few minutes. Then remove the idlis using spoon of butter knife. Can I use all Sona masoori instead of para boiled? NO. please use parboiled rice. Sure, I will post medu vada recipe soon. Looks nice and fluffy share uttapam if you can. Thank you for this tip. I have also heard this but never tried. I will try it next time.